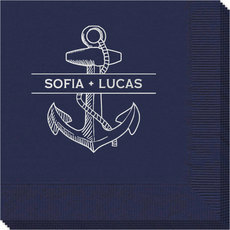 Sample shown in a Champagne napkin with Navy Blue imprint. Sample shown in a Skipper Blue guest towel and Ivory imprint. $34.36 $42.95 As Low As $0.25 ea. Set of air-laid paper napkins which have the look of linen with a thicker, plusher, more luxe feel. Select your napkin color, napkin size and imprint color of personalization. Typestyle and positioning only as shown. Napkins are shrink wrapped in sets of 50.